There is an old saying that goes “deals are signed in the office but they are made in the dining room”. While this may be an oversimplification, it doesn’t stray too far from the truth. Good food and good business have always gone hand in hand and to be completely honest, it doesn’t matter if you are a small firm entrepreneur or work in the ivory towers of big time corporations, if you are not prepared to wine and dine your current or potential clients, you are handing business to your competition. It is not enough though, to simply entertain your customers, you must do it in the proper way. There is a complete etiquette that is associated with hosting a business meal, whether it is a lunch or dinner, and it pays to know the rules going in. This should be a no-brainer, but it is one that has probably broken more deals than any other. If you are invited out for a meal, then you are the guest. If you issue the invitation, then you pay, period. Many times people will offer to split the tab or even pick it up, this is just a courtesy. The guest does not pay. If you can’t shut down your phone because you know you have an important call coming in, let your guest know ahead of time that you may be called away for a few minutes. It is much less rude to tell someone, I may have an emergency call coming I’ll have to take, than to just cut them off and leave them sitting. You could easily think of a business dinner as a first date. You are there to impress your client and make them like you. Just like on a date, you should allow them to order first. This is not only proper business etiquette, it is a way to garner valuable insights into your relationship. If they order a main course and water only to drink, it might not be a good idea to order five courses of food and bottles of wine. By the same token, if they order a full meal, it is a sure sign that they intend to have a long and serious discussion with you while in this relaxed atmosphere. This may well be the most important item on our list. Getting the restaurant right is of paramount importance. It should reflect both your company culture and the value that you place on the client’s business. It should be a place where you can make a reservation ahead of time and where you can be assured of getting the best available table. Nothing can kill a deal faster than wasting a client’s time waiting in line or looking shoddy by being seated in the back by the kitchen door. 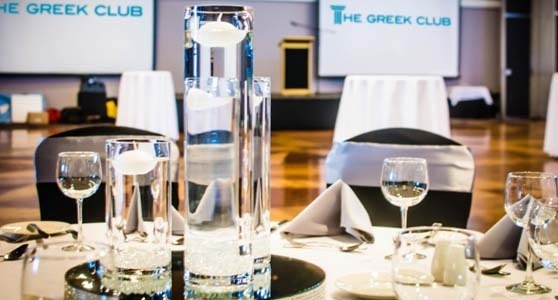 A perfect example of a proper venue, here in Brisbane, would be The Greek Club. There is no better way to cement a relationship with a client than to sit down to a relaxing meal. Remember these few pointers and you will have the battle half won before you even begin.